Note: All views are entirely the personal views of the author and is an open expression of sharing the journey with those who enjoy similar experiences. Reader's discretion is advised. Ganeshpuri has been and will always be a special place for me for it is from this land i started my spiritual journey. It was to this land that my Bade Baba called me close to about 3 years back. 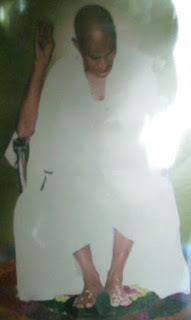 (For more on my first encounter with Bade Baba click here) This is my fourth visit to this divine place and have never preferred writing about the magical visits here. This time i prefer to write because it is more than the routine limited space of Ganeshpuri that we must be knowing. From the very first visit to this place i somehow felt there is an astral world in this place. Over months, i was collecting more information in and around the places of Ganeshpuri and often wondered why Bade Baba after walking a stretch from Kanhangad through the coastal land preferred to arrive at Vajreshwari and settle down at Ganeshpuri and taking samadhi here. i am fully aware that whatever i think or write or perceive is very, very, very limited and tiny to what one can write about a divine incarnation - Bhagwan Nityananda. It all happened pretty quick. As Ganeshpuri was lingering in my mind, Pratap from Goa contacted one evening regarding Kanhangad visit. Quickly he said that he was planning to be in Mumbai soon and we soon fixed up a date one weekend matching his day also informing that Shyam would join. Surprisingly, Sivadas from Chennai contacted for something the next morning and i spoke of this plan and he said he also was planning to be in Mumbai around the same time and said was eager to join. Mumbai seemed to be a common word. Now i could confirm that it was to meet the living Siddha in Mumbai who lives in Mumbai, who is the disciple of Shaligram Swami (close disciple of Nityanand Baba) whom people called Karunakara Swami. Swami Vijayanand of Bevinkoppa ashram often spoke to me about him and his leelas and his experiences with this divine being who knew everything even before people arrived to meet him. However, he preferred to stay in the same place for 40 plus years after Baba Nityananda instructed him to do so and he stays in one of the biggest slums of Mumbai in a Labour Camp in Matunga, Mumbai. Swami Vijayanand had instructed me to meet Swamiji more than a month back and it was now that i could fructify it with the Ganeshpuri visit. On 16th November morning, me and Shyam bhai reached Borivilli by an overnight private bus from Belgaum and Pratap and his brother reached the same place by an overnight train from Goa. i called up Manju anna (Manjunath) an ardent disciple of Bade Baba and Swami Vijayananda, who was so very kind to come and pick us up and drop us in a hotel where he had arranged things for us. Giving us some time to freshen up, he left and returned at 9 a.m. and we left towards Matunga. Meanwhile, Sivadas had taken an early morning flight from Chennai and was waiting at the Santa Cruz airport. We picked him up on the way.. was delighted to meet him after our last meet a month back at Bevinkoppa Ashram. Manju anna visits Karaunakara Swami regularly and thus easily took us to this place. The entire area was slum. As i looked around i was lovingly surprised at the areas where Siddhas chose to reside - all for mankind. He did not speak anything to us but spoke a lot to Manju anna and as he did he gave us occasional glances and sometimes stares. i just closed my eyes and meditated there and the energies there could be sensed easily as strong... a very meditative space amidst a slum of so much noise and lower vibrations! As he spoke no one spoke and Swamiji's questions to them were very assertive that was seemingly not able to be answered back to him while some shed tears as he spoke. Some just sat there with eyes closed. Swami Vijayanand had once shared many stories of his own with Karunakara Swami. During the time when Swamiji had just set up the ashram, someone with some neck problem had visited Swami Vijayanand and was soon cured, but Swami Vijayanand found it difficult to swallow food. 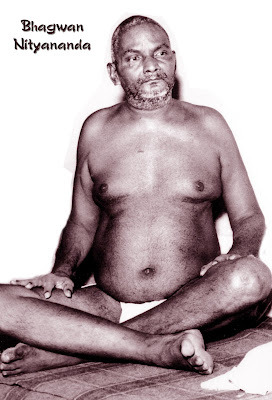 When he met Karunakara Swami, he immediately told him that he had taken the karma of that person and asked him to be given something specific to drink and as soon as Swami Vijayanand did it, he was able to eat after that. Also before Swami Vijayanand had set up the ashram, while he lived near the caves of Sogal and did sadhana someone from the village used to regularly bring Vijayanand Swami tea and biscuits. Once when Vijayanand Swami met Karunakara Swami, he was quickly asked, "So how were the tea and biscuits that came to you?" and that was time Swami Vijayanand realized it was Karunakara Swami who was sitting there and managing things for him here. Swamiji did not like being photographed or recorded. Manju anna told me that his words always make sense and is understood when he is speaking but when he comes out he cannot recollect them. So one day, Manju anna thought of recording what Swamijii says and tried to pulled his cell to record to which Karunaka Swami immediately resorted to put it back stating, "Keep it in, it is not required." 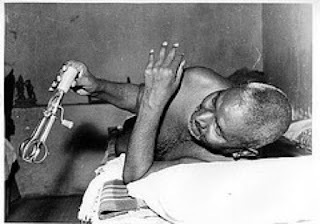 Another time when the people of press were there, they asked Karunakara Swami permission to click and Manju anna laughingly said that for one full hour the cameras did not work and later Karunakara Swami teasingly laughed over this matter. We sat there for long that Sunday morning and it couldn't have been more pleasant and divine than this. As he spoke, all eyes were fixed on him. Though not a single word could be understood, there was so much one could receive from him by just 'being there'. Soon, Swamiji signalled to the people in front of him to leave and as they got up Manju anna also got up. Swamiji took the little bags containing fruit and prasad and gave it to each one of us as we touched our heads to his feet. The extremities of his hands and feet were worn out and he wore socks. This was due to the intense years of sadhana he did in Himalayas after Bade Baba had instructed him to do so and after that he has never gone anywhere after he came here to this place. As all left, Swamiji was talking to a person and i went to the altar of Bade Baba and stayed bowed there for a while. As i did, i heard Swamiji stop speaking and i wondered if he was looking at me. As i got up and turned he was. i immediately folded my hands and bowed taking leave and he nodded in agreement. Just that one moment was the most magical time for me in the whole meeting. Since it was already noon, we had a happy lunch itself. We were planning to go to the ancient Kanheri Caves in Borivilli and then take a train to Vasai and then a bus to Ganeshpuri, but Manju anna was so kind enough that he insisted that he would drive us to Ganeshpuri. As we drove towards Ganeshpuri which was around 80 kms from here, Manju anna shared more stories about Karunakara Swamiji and his mystical ways. After an hour's drive we approached the holy land of Ganeshpuri, another place itself camouflaged on earth :) Driving up the holy hill, we parked in front of the ashram and soon got rooms that was also kindly arranged by Manju anna. We visited first the Samadhi Mandir of Bade Baba and the Maa Bhadrakali Temple Manju anna preferred to leave. i cannot thank him enough for him leaving his busy meetings and business behind and making time for us and all his great help. We then went to our rooms and freshened up. Then, we went around every place of importance. i could not wait to rush to my most favorite spot, the huge chair of Bade Baba, where he would often be sitting, in Kailash Nivas. Moving into the huge hall of Kailash Nivas, the abode of Bhagwan Nityananda, is enough to bring one to another dimension. One has to be only be present and aware of this place where Baba spent more than 25 years where thousands from all over flocked to have a darshan and where Baba did so many leelas. Stopping at all places at the places Baba often sat or laid down, we then moved to the Swami Shaligram Samadhi Temple, my favorite place after the Kailash Nivas and Nityananda Samadhi Temple. i have had beautiful experiences here in my previous visits and this is a very powerful place. i love the atmosphere here during the arati time here. 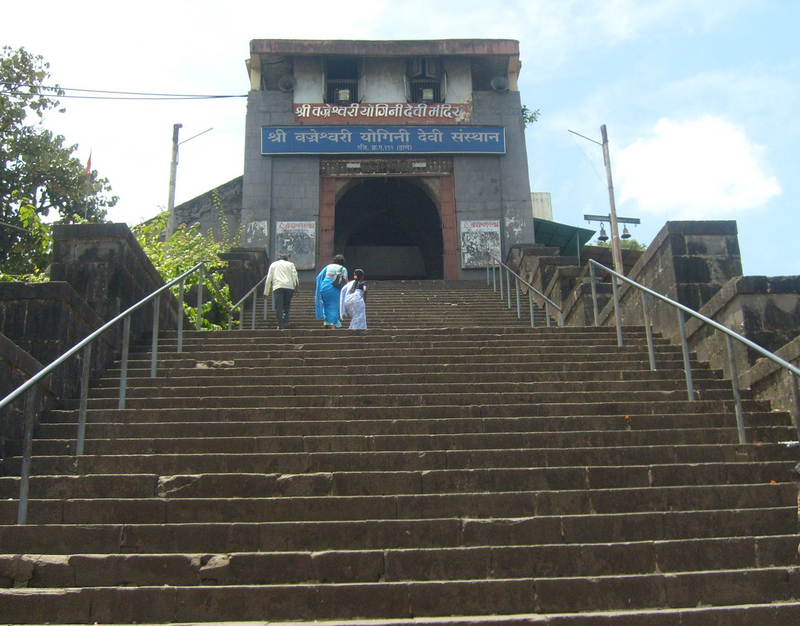 Swami Shaligram's cot, asana and padukas are kept here close to his samadhi that faces the South. Swami Shaligram, a very close disciple of Baba had taken Jeeva Samadhi (leaving body at will) at a very young age, just three months before Bade Baba took samadhi after taking permission from Bade Baba. In 1961, Bade Baba instructed, "Shaligram is mahayogi. He wishes Jeeva Samadhi. Construct a good tomb. Place his body facing south. He is Agni, the Fire God. Do not break open his head for He shall be at the service of devotees for the next 500 years." Shaligram Swami's has a fascinating and powerful look that connected one very easily. We did not want to miss the evening 7 p.m. arati here and since there was time, we went to the Bangalorewala building. This place was built by Baba's disciples few weeks before Bade Baba's Samadhi and this building has many dormitories and rooms that houses large number of pilgrims. On one floor is a huge hall which has a bed, on which Bade Baba left his body on August 8, 1961 at 10:42 a.m. This hall has a provisions for sitting and meditating. Through the window can be seen the Tansa river. After a while here, we attended the arati at Shaligram Swami's Samadhi. While we strolled through the stalls, we were told by one person there about the places around, something that i was very keen visiting this time. He spoke about Lord Parashuram spending most of his childhood days there at the Holy Mandakini Mountain where he had also performed a yagna. We were interested to go and told him clearly that we were not going for visit and we would be meditating on those locations and that it could take time. He said that we could book a taxi and one of them agreed to join us. We then had dinner and went early to bed and got up next morning at 3 a.m. and went straight to the hot kunds (hot natural springs) and took bath. 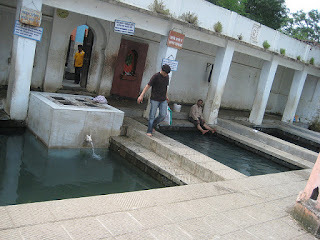 Bade Baba often sent people to bathe here as cure to ailments. This spring has healing powers and these three springs are next to the Samadhi temple of Bade Baba in front of the Bhimeshwar Temple. All three kunds have different temperature ranging from mild to hot. 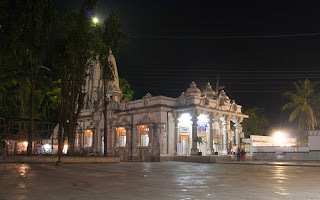 Bade Baba himself told many devotees that many divine beings come here for bath at the Brahmamuhutra and some devotees even had the fortune of witnessing these. One night Mrs. Muktabai who went for a bath in the hot kund, saw some handsome youths who rushed from the spring tanks and disappeared inside the temple. When she told Bade Baba about this, Baba said that they were the Sanatkumars (the four sons of Brahma born of his mind alone-Sanakan, Sanadan, Sanatan, and Sanatkumaran). i was once told that these three kunds represent the three granthis - Bramha granthi (warmest kund), Vishnu granthi (warmer kund), Rudra granthi (warm kund). After a bath here, we meditated in the Bhimeshwar temple, the oldest Shiva temple in this area built during the 6th century. 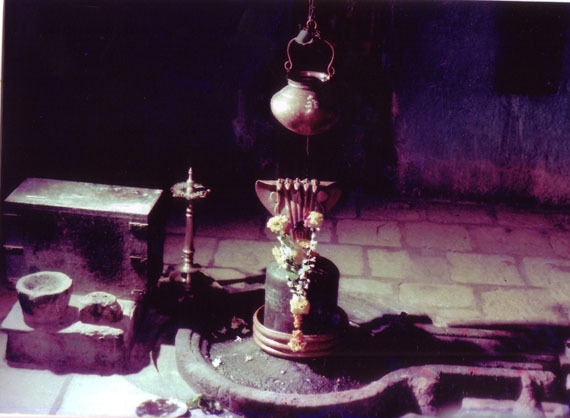 When Bade Baba arrived in Ganeshpuri in 1936, he lived behind this temple that had an ancient Shivalinga. At that time, the entire Ganeshpuri and adjourning areas was a dense jungle with wild animals. Meditating here is possible only during early hours of the morning in 'off-season' time as otherwise there are devotees walking in for worship. After this we moved into the Samadhi Temple for the early morning 4 a.m. kakad arati. Everyone meditated in the places they preferred until the 6 am arati. i spent my time in Kailash Nivas at Bade Baba's bed and chair. One cannot deny his eternal presence in these locations. At 6 came to the Samadhi Temple and this arati is very divinely experience for me. i have seen shaktipath happening to people (especially westerners) during this arati. It is extremely powerful if one is connected at this moment. 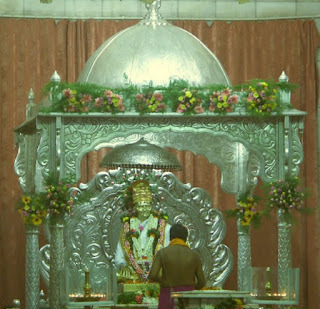 The beautifully lit large hall in which rests the mortal remains of Bade Baba above which is placed his beautiful life-size, real-looking Panchaloha idol to which the arati is done in all glory of many lit lamps in the hands of the priest. What adds to the heavenly experience is the splendid majestic rhythmic beats of the drum (they indeed awaken your kundalini) and the bells ringing in rhythm and pace of the arati lamps in the hands of the priest. The whole hall vibrates divinely and one has the best opportunity to remain in heavenly bliss. After this, we quickly had our breakfast and were ready to go by 8 a.m. The taxi (Sumo) arrived. It is surprising that we always have to have an uncle or aunty in every trip of ours. This time we were also joined by Uncle Subhash Amin, a follower of Swami Vijayananda; uncle was already in Ganeshpuri for a one-week visit. We told him that it could be hectic and time-consuming and moreover we would prefer to be much in silence and he seemed to be okay with it. The trip began towards the Mandakini Mountain. Bade Baba mentioned that many famous Siddhas lived in the mountain. The great Sage Vasishta performed a yagna here at Ganehspuri. The hot kunds (more than 360 of them) in this area were created by Sage Vasishta the comfort of the sages who had come for the yagna. In very ancient times many famous Siddhas have done tapas in this region. 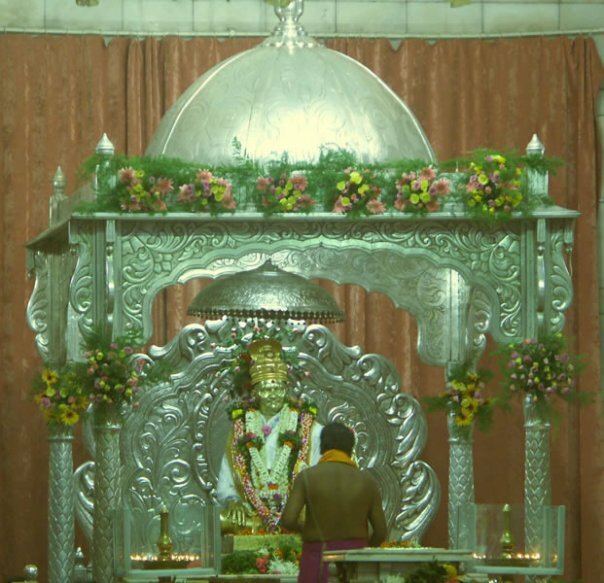 During one of the yagna, Sage Vasishta installed the idol of Lord Ganesh in a temple and thus the name 'Ganeshpuri'. There are two temples near the mountain ranges; One of the temples belongs to Shiva and the other to Renukamata, who was Parashuram’s mother. We reached the foothill of the Mandakini Mountain, which is on the border of Wada and Bhiwandi talukas. First we stopped at Amba temple at Gunj-Kati. 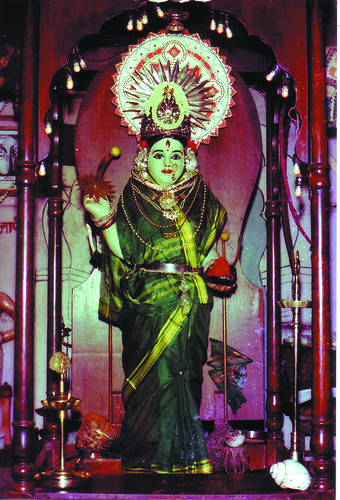 This is actually the original place of Vajreshwari Maa. This is the place where Sage Vasishta prayed to the Mother and he got darshan of the Goddesses. Only later was the shift made from here to the famous Vajreshwari Temple near Ganeshpuri. This temple is closed, but the person who assisted us had got the keys on the way from one of the houses in the village. The temple was powerful and we sat in meditation for a while. Right outside the temple is the Bhagirathi Tirtha (kund). As the others were still meditating, i came out and went into the trees behind the temple and sat besides a stream of water. Just sitting here was meditative enough. This entire place emitted high vibes. After a while i came back and joined others back to the taxi and we moved a little further about a kilometer reaching the foothill of Bhaargavaraam Hill. The person took us to a location nearby a lake and pointed out that a Siddha had taken samadhi in the lake. i presume it would be a jal samadhi. He then pointing to huge black stones that looked as old as creation and mentioned that this was the place where Bala Parshuram lived. It was unbelievable that we were standing on such places. We spent some moments in silent contemplation there. Then he pointed out to a temple hidden among the trees on the hill, which was an old temple of Lord Parashurama. We then began climbing the hill. The sun was blazing but the sense of being in this awareness of divine energies made it just easy :) As we walked, he told us that Sri Adi Shakaracharya also has visited this area. This temple is beliieved to have been built by Bhima (pandava) and he shared that this temple was worshiped by many and many sages including tantriks came for sadhana. We were told there are some mysteries to this temple. On entering the temple it was enchantingly beautiful and we got into a deeper enclosure where the idol of Lord Parshurama stood. He had brought water from the kund and did abhishekam and collected the water back. By now it was quite evident that he was a staunch follower of Lord Parshurama and not just he but the villages around here also were. He spoke about many legendary stories and also shared that he visited these places alone quite often and has even stayed overnight on the Mandakini Mountain. It was quite obvious with the way he navigated through this place and had so much of information. i could see that he was continuously pouring out information and could see that he was happy to share it because it must be rare for him to get someone who are interested in these things :) Behind the temple was a path to climb through the rocks and he guided us up there and showed us a spot where a much-feared tiger used to live. There were tigers and wild animals spotted beyond the Mandakini Mountain even these days. He told us that none till date succeeded in living in this temple or around this temple. If anyone attempted some weird things happened to make one run out of there. Anyone with ill-motives is believed to get 'driven' out from here. Lord Parshuram is believed to walk these hills even today and many claim to have seen him. Then after snacking over biscuits and water, we moved further into the forest guided by him. He seemed to know every piece of land in that area for he very casually walked through the trees and shrubs, talking all the while and stopping at regular intervals to tell us the significance of those spots or information about the area, which quite surprised me on his abundant knowledge about the historical events and the awareness of current mysteries that happen there. He seemed to be happy emptying all that he knew for he must have found it worthwhile after a long time because our hunger for it increased as he revealed things one by one. We sometimes stopped at places just to feel that place and to do some energy work. All the while i was walking in awareness of the total area and surroundings. Mystical things happen when one does this. After descending down the hill through the greens, we came to a small hut that seemed to be the only huts in those mountains. As we entered, i switch on my cam in the video mode and was wondering what it could be. As i was shooting, i followed him, who entered the hut and outside in the verandah of the hut was a cot and someone sleeping with a bedsheet covered over the face. He gently touched him and as the sheet uncovered, a surprised face of a thin old bearded man came out of the sheet. He looked very happy and surprised to see him, and i kept shooting with the cam. Then he revealed that this hut was the samadhi of Siddha Shankar Swami and this yogi was living here at this samadhi since 40 years! We all fell at his feet and he blessed us laughing happily and was only saying "Baba, Baba" loving to all. He seemed to know only Telugu fluently but then was managing to speak Hindi in bits. Swamiji then asked everyone to visit the samadhi inside. There was only one room inside and in the center of this room was a huge samadhi built. 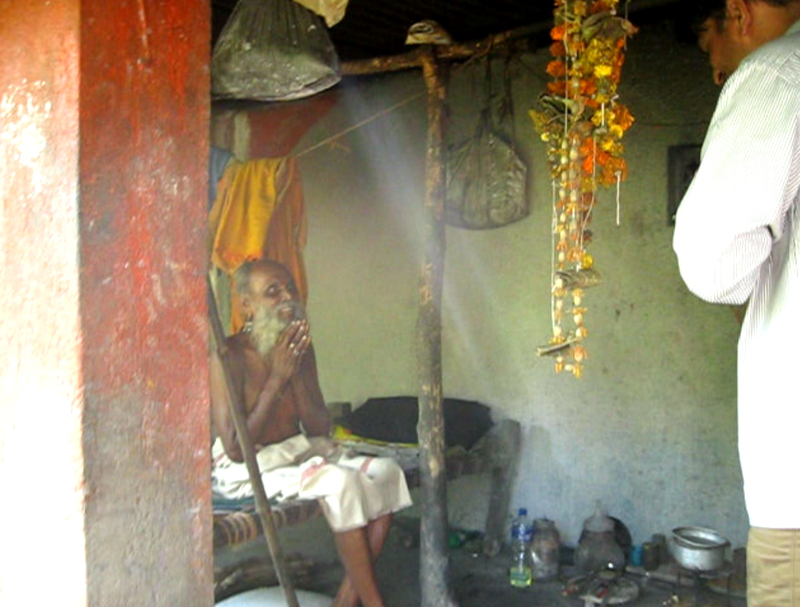 It looked very obvious that Swamiji was living outside this hut in the verandah because inside apart from the Samadhi only a few things were hung to the wall and other materials were a few vessels and the very few of his possessions. Behind the samadhi was a photo of Baba Nityananda. After we visited the samadhi we came out. Swamiji then sent us down below a few meters from there to a stream and asked us to wash ourselves there. This was the stream where the Siddha used to bathe and drink water. This Siddha lived on one spoon of soaked grams for all the years he lived there. 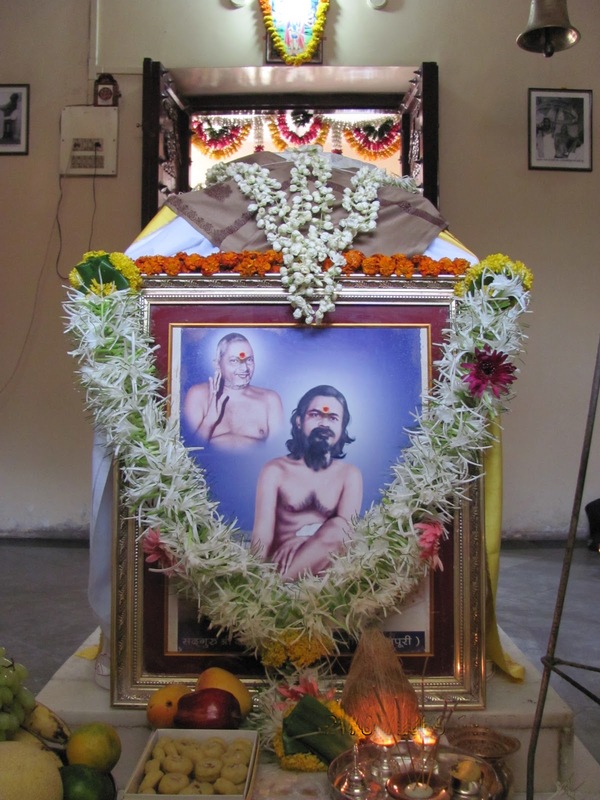 I was very surprised to know that Siddha Shankar Swami was sent by Nityanand Baba here to do tapas and he followed the instructions of his master. He is said to have demonstrated leaving his body for a few times before he actually took samadhi. We then went to the crystal clear pool and washed ourselves in the enclosure where he used to take bath and on one end of the stream was another man-made enclosure made for drinking water and he used to drink water here. i found this water crystal clear with small fishes in it. We drank water from here and also re-filled our bottles here. As we were on the outskirts of the village, he asked the driver to stop and ran into a hut to enquire something and signalled us to come. As we went, he introduced us to the priest there, who was responsible for renovating the old temple and starting puja there up the hill in the Parashuram temple. He invited us for prasad and took us into his hut where there were idols of Maa Vajreshwari and Lord Parashuram. He did arati and prayed for us alland gave us all prasad after we took his blessings. He was a loving person and so erre all of his family members who treated us all with so much of love. We then bid the priest and his family goodbye. Then we headed towards Vajreshwari stopping at one restaurant on the highway for lunch. From there we went to Akloli near Vajreshwari, where Bade Baba lived for 8 years first place after entering Vajreshwari before he went to Ganeshpuri and cleaned up the area and made an ashram. We visited the temples and all the possible hot water kunds in front of the Vajreshwari temple. Here is worshiped the padukas of Bade Baba. Vajreshwari is also famous for its hot-water sulphur springs, which are supposed to be medically good for the skin and bones. These kunds were where the river Tansa flowed and far behind the river was still visible the Mandakini Mountain. It was a beautiful view. Then coming back to the taxi and keeping our footwear in the vehicle itself, we moved towards the Vajreshwari temple. The Vajreshwari temple is perched at the foothill of a hill. On the top of this hill is a Samadhi of a Siddha. The path to this Samadhi is led by stone steps. Last time i had come to the temple, i had an excellent time with meditation here and we all had decided to do the same here. Never did i know there was a Siddha samadhi above the temple. We went into the temple and had darshan of the three main goddesses here - Vajreshwari, Kalika, and Renuka Devi. 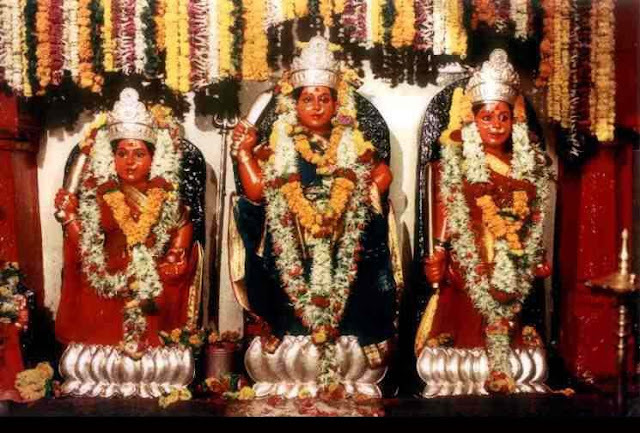 I had never noticed who the three goddesses were until this time and it was only now it was evident to me how this place was connected to the Anand Ashram in North Karnataka including the places i traveled from there. Anand Ashram is the place where Lord Parashuram was there because his mother (Renuka Devi) had lived there in Saundatti, which is around 35 kms from the ashram and and only further 25 kms is Kalika Devi's home at Sirsangi. So, after our travel to these places and meditating there, we were able to come this time to the hills near Mandakini that was the original place of Vajreshwari Maa and Lord Parashuram's birth place. Lord Parashuram was imparted with the knowledge of advaita by Lord Dattatreya near Saundatti and the conversations that took place between them was written as "Tripura Rahasya" by Lord Parashuram's disciple - Maharishi Sumedha who was also initiated into Sri Vidya by Lord Parshuram. 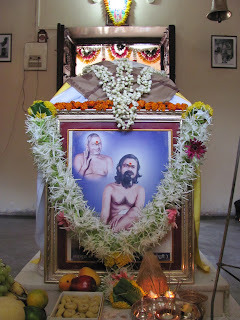 The samadhi of Maharishi Sumedha is where Anand Ashram (read) is built in Bevinkoppa. i am amazed at these chain links. After darshan and being in this highly energetic space in front of the idols, we decided to first go up the hill and visit the Siddha Samadhi first before settling down for meditation in front of the Mother. As we tread on the stony path, a much more clearer view of Ganeshpuri and surrounding areas became evident. This place is not much known but can be a treat to seekers on the Siddha path. We spent some moments here. Photographs are not allowed here. As i came out and caught an enchanting view of the entire area from top of this divine hill, i could see the Mandakini Mountain standing in its glory; it actually never left our sight from the time we came back from there and was visible at every point till here and is also visible from Ganeshpuri. We then moved down the hill back to Vajreshwari Temple and did our meditation there. By the time we finished it was dark. We then had some tea and snacks in a hotel and went to the place where Bade Baba used to sit near the samadhis of many saints. Two of these were told by Baba to be the samadhis of Mahasiddha Machendranath and his disciple Mahasiddha Gorakshanath of the Natha Sampradaya (lineage) and one of the 84 Mahasiddhas. There is a reference in the Navnath Granth of Machendranath meeting the Vajreshwari Maa, who was then blessed with many spiritual powers. The Nath lineage are considered to be the initiators of Hatha-Vidya, Laya-Yoga, Nada-Yoga and Kundalini-Yoga. Gorakshanathjiis also the founder of yoga orders of Kanphatas, Nathas, Gorakhanathas and Kaulas, comprising of the Tantra Yoga tradition. We went into this place that was also the house of Swami Shankar Tirth, who was directed by Baba Nityananda to stay here. He did so but the next morning returned to Baba visibly shaken after being troubled the frightening nightmares cobras attacking him and asking him to leave the place. After paying respects to the Samadhi place and the small Shivalinga temple, we left back to Ganeshpuri ashram. We had food and we back in our rooms. Soon we were all sound asleep. Next morning we woke up at 4 a.m. and took bath in the hot water kund and as usual meditated for a while in the Bhimeshwar temple and then after the Kakad arati, i went to my favorite spots at Kailash Nivas and returned for the main arati at 6 a.m. After breakfast, we decided to go up this Ganeshpuri Hill to meet Swami Vishweshwarananda Saraswati where he had his own ashram. i had met Swamiji during one of my travel who had invited me to his ashram at Ganeshpuri. More than anything, i was keen to go here because this was a divine spot having samadhi of Siddha Sankara Swami and also the spot where Karunananda Swami of Gokul had done tapas. Karunananda Swami was a disciple of Baba Nityananand who on instructions of Baba spent the rest of his time in Gokul till his samadhi. Also, i wanted to visit the At the same time, Balu Maharaj, one of the chief priests of Baba's Samadhi temple, had been inviting me for lunch but due to time constraints had promised him we would come for tea and thus we decided to go there first and then up the hill. Balu Maharaj's house, whose house is at a walkable distance, been doing arati at Bade Baba's samadhi since 1978. Sitting there, he shared a lot of stories of Bade Baba's leelas. After being here for about an hour and taking prasad, we took leave of him. Then, we went up the hill to an ashram on the hilltop named Bramhapuri. Swamiji was out of town and so we could not meet him, but the man in the ashram took us around and showed the prominent spots. We meditated at the Samadhi of Siddha Sankar Swami (in the video below) A little distance further was a small Dattatrey temple below a pipal tree, which was the spot where the Siddha used to meditate. Then coming down the hill, we attended the arati at the Samadhi temple and had lunch. Then returning to our rooms, we took a brief power nap and soon were packing up our bags. We met an elderly lady who had a beautiful voice; she had sung a beautiful song at the Bhadrakali temple the previous morning and we requested her to sing. She and her husband readily came into our room and sang Mahishasurmardini and we accompanied her. Thanking her after she left we made our way to Siddha peetha to visit Baba Muktananda's samadhi place. Since it is not open the whole day, we waited for it to be 4 p.m. and then took an auto there. The vibrations here were splendid and we meditated here for a while after having darshan of the Shakti temple here, which is also a powerful place. It was beautiful to connect with Baba Muktananda, whose book i had read and that had brought me to Ganespuri 3 years back (read). It was time to leave. Then we took the auto back and picked up our bags and walked to the Ganeshpuri bus stand and in few minutes got the bus to Vasai. i had my train back home from Vasai, whereas others took a local train from here to Dadar. After they left, i spend few hours on the platform after dinner, reading a book and listening to music. Boarding the train, i reached back home the next day by noon. Lastly, as we left the accommodation at Shaligram Nivas, i could not miss to admire and adore a few pictures of Shaligram Swami in the hall. Every picture of them both fails to hide the silence in the photos and just bursts our with their energy exchanges. Two pictures caught my eyes and i stared and stared at the love exchange between Bade Baba and Shaligram Swami. They spoke volumes of their closeness. When Bade Baba looks away, Shaligram Swami stares at Bade Baba with so much of love and when Shaligram Swami looks away, Bade Baba stares at him with so much of affection. It's like how two close people when look at each other the other pretends not to know that the other is looking :) :) :) . i captured those two pics on the cam, which are below. A splendid journey with so much of encounters with the world of the physical and nonphysical realms. Three days but the activities seemed to be of three weeks! An everlasting gratitude to Bade Baba and all holy Siddhas.